After spending decades researching and brainstorming answers to the question "what will make emergency management more efficient," a rural fire chief, a retired federal fire manager turned consultant, and a state district forester came together to come up with a plan to better their districts. They needed a way to share information on emerging incidents across a broad spectrum of cooperators, and to minimize repetition, redundancy and confusion throughout an event at any time, no matter what type of situation could spring up. Traditionally, they had been using maps and handwritten notes that just weren't able to be readily shared with responders throughout the county. So they found a better way. In 2003, after the completion of the Keno, Oregon Community Wildfire Protection Program (CWPP), KCSA was born. They spent years gathering information on structure and parcel fuels data for Wildland Urban Interface (WUI) properties. As time went on, they were granted state funding to hire and train summer interns to collect even more data on over 10,000 Klamath County WUI residential properties. They collected information on construction attributes, wildland fuel conditions, a photo of the structure and a composite risk score. From this point, they took this data and sent it to each responding district on CDs and hard copy maps. This was good for a time, but it didn't solve every problem. Particularly, the problem of having data at your fingertips in a rapid fashion via the emergence of smartphones and tablets. After the Yarnell Hill Fire of June 2013, fire managers were reminded that they needed innovative and better ways to know and understand in real time the location of incident resources. 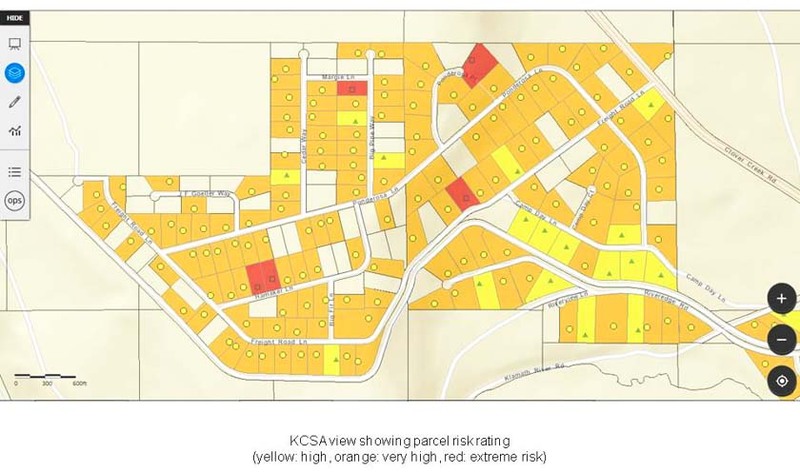 Later the same year, the group selected Intterra to integrate the Klamath County structure survey data, collection process, and other information into Situation Analyst (SA) and the SA Field Tool (SAFT). Using SAFT along with KCSA allowed Klamath County to keep an eye on key information like where the engines are located and what they're responding to. Real-time incident mapping is also availble on touch screen devices as well as structure pre-plan data collection, and a property owner feedback process. Their systems incorporate the capability to track resources by cell phone GPS or commercial tracking devices on vehicles and personnel, as well. "Klamath systems incorporate the capability to track resources by cell phone GPS or commercial tracking devices on vehicles and personnel, as well." These systems were brought together and offered real-time, shareable, interoperable information on a common operating platform, thus solving a majority of the issues they had been experiencing and increasing public safety along with the safety of the responders. Mapping, collected data, and pictures can be shared to users of KCSA when the device is connected to the internet. But fire managers are quick to point out that technology isn't what saves lives. Combining real-world experience with technology that can be easily shared, understood, and used by firefighters in the field is what makes the difference. Folks all over Oregon are using the applications and systems developed by Klamath County and Intterra in the State, regional, and local agencies. The Oregon State Fire Marshal (OSFM) is supporting the use of the applications by OSFM Incident Management Teams. KCSA was used on wildfires in the southeastern states in 2016. Klamath County fire districts, Oregon Department of Forestry, and federal wildland fire agencies are currently using the software. Use of the applications is spreading into many other counties in Oregon. Odds are, we're going to see this interoperable trend continue in Oregon and look forward to seeing much fewer and fewer responder injuries as well as reduced structure damage, better response times, and faster, more reliable real-time data. If you're interested in learning more about Situation Analyst, be sure to contact us. We'd be happy to explain the system to you and help discover how this tool can bring your county in your state into a better, more reliable data network. If knowing the real-time location of your district's resources while working on an incident along with the safety of responders is important to you, we'd be glad to help.